senses, and agonised by carnal hankerings." Acharya Srimat Swami Pranavanandaji Maharaj (picture on your right) was an incarnation of Lord Shiva. He lived in the first half of the Twentieth century. Acharya Deva was born in the year 1896 in what is now Bangladesh and strove to realise in the Order he founded (the Bharat Sevashram Sangha), an organization which would bring new energy, life and pride to the Hindu masses and the world. He was only 44 when he attained Maha Samadhi on January 8th, 1941. He left his imprint on India in various ways. 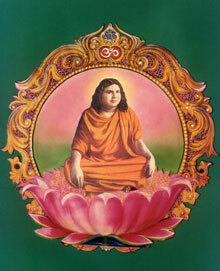 From his very childhood he would always remain immersed in meditation and self contemplation. In the Kali Yuga, humanity is afflicted by diseases both physical and spiritual. It is rare for men to live beyond a hundred years. Religion is in decline, and various forms of viciousness are on the increase. The dharma, in other words, is no longer preserved and this, in itself, affects the health of society. Still there are those who struggle against this downward flowing stream, they swim higher. They are saints and human beings of great virtue. And their births are typical by all kinds of signs. Such was the case of Acharya Swami Pranavananda. He was practising being a holy ascetic, preparing himself for his future career. During this span of intense preparation, he was supposed, moreover, to have had a spiritual experience of great power when he was very young. The story was told by him many years later, when he was already in his 20s, but there was no reason to doubt the authenticity of the account. He refered to the experience in conversation with Swami Purnananda for instance, in October 1924, when he said: "My first God-realization came to me at the age of six. 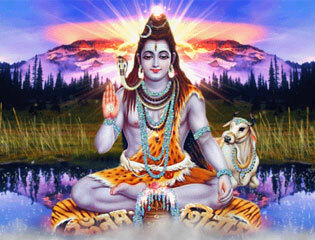 For the Hindu austerity does not empty you it fills you with power." As Hinduism serves, so to speak, as a window on the Acharya so this life of the Acharya may serve as a window on Hinduism. First, if his dynamism has helped to create a new conciousness within Hinduism which can lead to a restoration of Hindu values and a flourishing of genuine religion, then this is something of vital moment to global civilization, in which Hindu values must surely play a major role. Second, his accent on austerity presents an ideal from which many outside India can learn. So the first main comment about the Acharya is this - that he was the chief apostle of tapasya in the modern period, but he applied it in a positive, practical manner to contemporary problems. 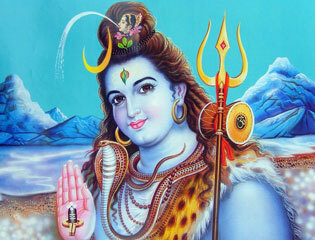 He was traditionally Hindu in thinking of the transmission of power and energy in a sacramental manner. On the whole, modern commentators on Hinduism have underplayed its strong sense of ritual. This is partly because in the West there has been a progressive watering-down of ritual practice and a distrust often of anything that can be seen to be "ritualism". The Acharya applied the principles of ritual to his own organisation and his own sense of destiny. Since he felt himself to be chosen as an instrument of the divine will, and a channel of the energy of the All-dispenser, he provided means for transmitting that power so that he could energise his followers and, more broadly, the Hindu nation. Because of his emphasis on the Hindu national ideal he was nesessarily drawn to emphasising the vitality of the ancient heritage. A group gains its sense of identity through recalling, pondering and celebrating its past. Conciousness is thus shaped by sacred and historical narrative. To point to the Hindu past was therefore a necessary part of the preaching of the Sangha. On the other hand his reforming attitudes were themselves, in their own way modernising: to build pilgrim rest homes in the holy places was to bring something new to the scene; his flood and famine relief work among the poor pointed towards more systematic efforts to resolve age-old problems with up-to-date activities and institutions; his concern for breaking down caste barriers could also be regarded as modern in spirit. It was done with a view of restoring a sense of pride and that pride depended both on action today and on a recollection of ancient glories. In that sense he was a traditionalist, but he was a traditionalist with untraditional energy. We believe in the light of modern conditions; the decline of moral and spiritual values, that a continuing exposition and interpretation of the philosophy of the Hindu Scriptures such as the Bhagavad Gita, Bhagavatam and Ramayana are to be used as Guide to a sublime way of life which would provide peace, solace and spiritual tranquillity and lead mankind to the path of consciousness of the "Self". Let the scriptures be your Guide!